One of CEDI’s newest partnerships is taking unique approach by inviting multiple First Nations and Municipalities, as well as an economic development corporation, to the table: Curve Lake First Nations, Hiawatha First Nation, the Township of Selwyn, and Peterborough and the Kawarthas Economic Development. Emphasizing their regional approach, these partners have also approached the Township of Otonabee-South Monaghan and the County of Peterborough as potential partners. On February 15-16 (just five days prior to the National Indigenous – Local Government Partnership Forum), this new partnership gathered for their first joint relationship-building workshop. Each partner completed a self-assessment of their current relationships with the other partners in the room, and had the opportunity to share their community’s/organization’s history, current economic development initiatives/priorities, and their visions for future collaboration. 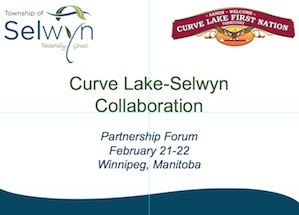 As presenters at the Partnership Forum, Curve Lake Councillor (and former Chief) Gary Williams and Selwyn Mayor Mary Smith delivered an engaging and thorough presentation on their community’s rich history of collaboration. They described the various ways that their councils work together, including regular tri-council meetings with the neighbouring township of Trent Lakes. They also shared their hopes and excitement about participating in CEDI, and the economic development opportunities it will generate. Their goal, by working with a regional approach, is to demonstrate a model of First Nation-Municipal collaboration that can be learned from and implemented in other areas of Ontario.